Fern plants add a natural beauty to any décor and make good houseplants. Used indoors around homes or outside on patios and decks, ferns grow best in low-light settings. Many tropical fern varieties flourish in high humidity locations, such as bathrooms. A healthy fern will continue growing until it fills up the pot. Repotting the fern at this time will ensure it keeps thriving. Plan to repot your fern in the spring for best results. Select a pot 2 inches deeper or 2 inches wider than the pot the fern is presently in. Use a new pot or thoroughly clean any pots previously used for other plants. Create holes in the bottom of the pot for drainage, if none exist. Fill the pot with at least two inches of good quality potting soil. Take the fern plant out of the old pot. Loosen and remove most of the soil from around the roots. Cut off any damaged roots. Make four vertical cuts in the root ball of the fern to stimulate new root growth. Spread the roots out and place the fern in the new pot. Fill the area around the fern plant with soil. Gently pat the soil to remove any air pockets. Fill the pot with soil to within 1 inch of the top edge. Water the repotted fern thoroughly. Do not add any fertilizer to the fern for at least four to six months. 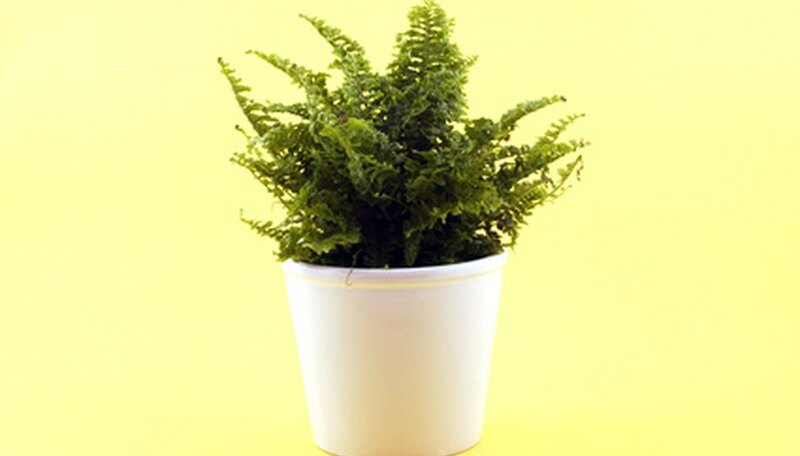 Divide your fern in half or quarter sections when repotting it, if desired. Separate the fern through cutting between the roots. Place each fern plant in its own new pot. Do this if you do not want to keep repotting the fern plant into larger pots.